As a healthcare marketer, it is important to understand the health transaction model. We recently talked about how good information is necessary as well as access to medications for healthcare providers. 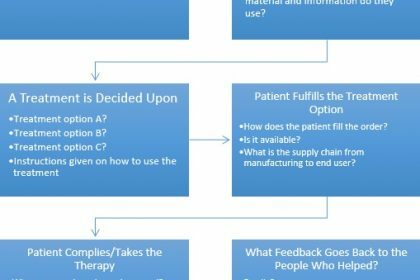 In this healthcare transaction model, the last step we covered was the consumer bringing their medication home and following the instructions offered to them – or compliance. Once the patient starts taking the medication, they decide after a couple of days if the treatment is working. If so, they keep going until the course of treatment is complete and move on. If not, they probably go back to the physician who gave them that prescription and seek further help. How can we, as marketers, ensure compliance with the treatment throughout the course of therapy? In short, how do we make sure that we have satisfied the end users? At the end of the transaction, a physician is “rewarded” for doing good work by the consumer’s utilizing his services again either in that course of treatment or subsequent illnesses. Marketers can help build this relationship between patient and physician by doing our jobs well all along the pathway. As marketers, we need to be able to think through the steps of this transaction and help to influence and/or mitigate the barriers to each step. How do we make the finding of help easier? How do we ensure that the physician knows how to properly diagnose the patient’s problem? How do we know that physician will prescribe the right treatment? Will that treatment be available at the patient’s local pharmacy? Is the treatment easy to use for that patient and will the patient comply with the treatment? Will they need more help? Does the MD know how to help further or will the patient need to seek specialized therapy? 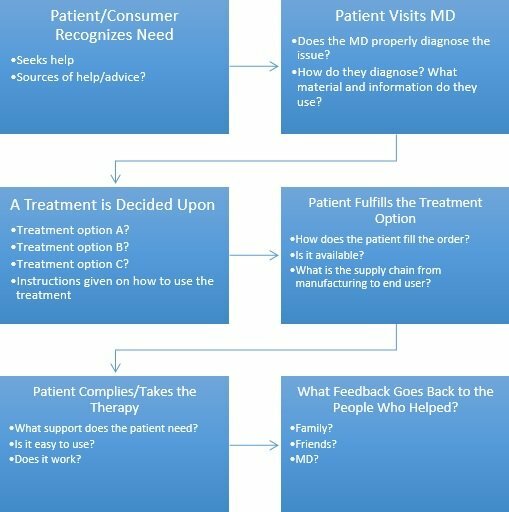 How does the patient find that special help? Once the therapy works, what feedback do they give to the MD who helped them? Who paid for all this work and how was it paid for? The transaction model is complicated with many twists and turns. We do our clients the best service by properly understanding each of these steps and helping them think through the strategic and tactical options to maximize their brands across this broad spectrum of work. One of the key steps to being a good marketer is to know which of these steps we want to make an impact on and how – as well as knowing which ones we can and cannot reasonably influence. If we can successfully navigate this transaction, we can help build successful brands.